Print 7 (station no. 6) from “53 Stations of the Tōkaidō”. Of the five main thoroughfares leading out of Edo in old Japan, the Tōkaidō was the most important and connected the old Imperial City of Kyōto with the new seat of government in Edo. Fujisawa, a town with a temple and a Shintō shrine, was the sixth station along the “East Sea Road” and the destination of many pilgrims. On a hill in the background are the impressive temple buildings of Yugyōji (est. 1325); the big torii in the foreground leads to Enoshima, where the Goddess of Good Fortune Ben(zai)ten is honoured. The temple stands in the distance upon a hill. The season is summer and pilgrims to the rain-making shrine at Ōyama, one of them carrying a large wooden sword, are crossing the bridge. 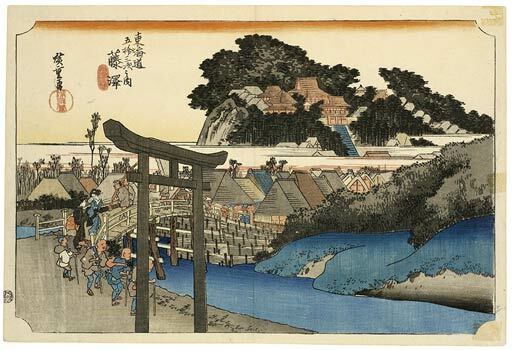 Three blind men and a boy walk beside the river close to the torii in the foreground. Reproduced in Ingelheim catalogue, no. 123.